In the battle to find great talent, a massive amount of time, energy, and money is being channelled into creative new ways to attract candidates. And there’s nothing wrong with that. Candidates hold all the cards these days, and businesses quire rightly need to be thinking creatively and strategically to attract them. But there’s something that businesses have used for decades in their recruitment activities that still has a part to play. And that’s the humble job advert. These days your job advert is more likely to be on your careers website or an online job board rather than in the local paper or stuck in a shop window. So how can you make sure your ad is engaging? How can you make sure it’s painting the right picture of your business? And how can you make sure the right people apply? Here are eight things to remember for a more engaging job advert. Your headline needs to carry the right sentiment to engage the viewer and get them to read the rest of the ad. A simple mention of the job title on offer might be factual, but it’s not as positive or engaging as it could be. Whilst many people will read your headline, only a small percentage will click through and read the content. So as far as a job advert is concerned, getting a good headline is hugely important. Make it positive, informative and engaging. And of course, accurate. If you’ve got your headline right, viewers will read on. You need to keep them reading, and then get them to respond to your call to action for more information, or to apply for the job. This is all about the words you use, and whether you’re saying the right things. Getting the sentiment and tone of your ad right is crucial. Your content needs to positively convey the sentiment around your brand and products, demonstrate your employer brand and do all it can to encourage those with the right fit for your organization to apply. If the text of your ad is too awkward to read, long-winded and technical, then it may not be understood. If it’s too factual and dry it may be boring. The readability has a real influence on the extent to which your viewer will engage with the advert. Focus on getting your message across in short sentences. Choose your words carefully. There’s often lots happening on a modern website, but not all of it needs to happen at once. Prioritize the initial visible content, often known as the content “above the fold” which is seen before the visitor has to scroll down the page. The browser isn’t being overworked and the server will load the remaining content efficiently whilst the visitor is viewing the prioritized content. It should go without saying that you need to make sure that the size of the words on your page is legible. But it can be overlooked that mobile devices can scale down pages and make the text very hard to read. Use a viewport to control the width and scaling of your pages and you’ll be certain that they’ll scale properly on mobile devices. Images can really help bring an ad to life, but make sure any images you use are optimized so that they’re quick to load and don’t cause problems for those using mobile devices to view your ad. Video is increasingly in use on job listings and is a great way to better engage with your viewer. But make the video available via a link rather than trying to embed it directly in the ad, as this will cause delays to page loading and make the ad slow to load and be seen. Drawing attention to a particular part of your text, for emphasis or to highlight a call to action or a quote is a great way to add interest and boost engagement. A block quotation is set off from the main text as a paragraph or block of text, and can additionally be in a contrasting, italicised or bold font. But, don’t overdo block quotes or their impact will be lost. Keep these eight tips in mind when writing your next job ad and you’ll have more chance of winning the war for talent. BEIJING (Reuters) – It can crack your smartphone password in seconds, rip personal data from call and messaging apps, and peruse your contact book. The Chinese-made XDH-CF-5600 scanner – or “mobile phone sleuth”, as sales staff described it when touting its claimed features – was one of hundreds of surveillance gadgets on display at a recent police equipment fair in Beijing. The China International Exhibition on Police Equipment is something of a one-stop shop for China’s police forces looking to arm up with the latest in “black tech” – a term widely used to refer to cutting-edge surveillance gadgets. The fair underscores the extent to which China’s security forces are using technology to monitor and punish behavior that runs counter to the ruling Communist Party. That sort of monitoring – both offline and online – is stoking concerns from human rights groups about the development of a nationwide surveillance system to quell dissent. The Ministry of Public Security, which hosted the Beijing fair, did not respond to a request for comment. At the fair, Reuters also saw stalls offering cute-looking robots, equipped with artificial intelligence systems to detect criminals, as well as an array of drones, smart glasses, DNA database software and facial-recognition cameras. At the fair, which is held annually, most buyers appeared to be local Chinese police, though some global firms attended, selling mainly vehicles and aircraft. Ford Motor Co (F.N), Daimler AG’s (DAIGn.DE) Mercedes-Benz and Airbus SE (AIR.PA) had cars and model helicopters on display. The companies did not immediately respond to requests for comment. It is not unusual for western companies to sell vehicles to overseas police forces. It was not possible to verify all the claims made about the products at the fair, including the XDH-CF-5600 scanner, which is made by Xiamen Meiya Pico Information Co Ltd (300188.SZ), a Chinese provider of security products and services. Scanners like the XDH-CF-5600 exist in other markets around the world, including the United States, but their use is contentious, especially regarding the forcible extraction of data from mobile phone devices. Chinese firms are rushing to meet the growing demand from the country’s security services, fuelling a surveillance tech arms race as companies look to outdo each others’ tracking and monitoring capabilities. Western firms have played little overt role so far in China’s surveillance boom. Beijing-based Hisign Technology said its desktop and portable phone scanners can retrieve even deleted data from over 90 mobile applications on smart phones, including overseas platforms like Facebook and Twitter. A big selling point of the technology, according to one policeman from the restive far western region of Xinjiang who was eyeing a Hisign scanner, was its claimed ability to get data from Apple Inc’s (AAPL.O) iOS operating system, used in products like the widely popular iPhone. “We are actually using these kinds of scanners in Xinjiang already, but I am interested in this one as it claims to be more successful with iOS phones than other brands,” said the policeman, surnamed Gu, who traveled 3,000 kilometers to attend the fair. He declined to provide his given name. The iPhone’s iOS system is seen by many analysts as the most secure operating system. A handful of firms in Israel and the United States have been able to crack into the iOS system, according to media reports. That ability is often shrouded in secrecy, however. At the Beijing fair, several firms told Reuters they could crack 4-digit passwords on platforms ranging from iOS 6 to iOS 8.1, and were working to break through security of the latest iOS 10 platform. The vendors did not demonstrate their stated capability of getting into security systems of older iPhones. Apple’s latest operating system uses a stronger 6-digit password. Apple declined to comment on the vendors’ claims. Chinese authorities are targeting a nationwide surveillance network, leveraging off tools made by companies like Hisign to compile data gleaned from smartphones and cameras into an online database of its near 1.4 billion people. “Our forensic products are sold in 26 provinces across China and have helped police process 11 million cases,” Han Xuesong, a sales director at Hisign, told Reuters at the fair. Hisign is not alone. Meiya Pico has a rival offering, the DC-8811 Magic Cube, which its marketing materials call “the Swiss Army Knife of forensics”. The larger FL-2000 is a “forensic aircraft carrier”. Pwnzen Infotech, a firm backed by Qihoo 360, a cybersecurity specialist, was another scanner maker at the fair who talked up its system’s ability to get data from overseas platforms. A sales representative described a case last year in which Pwnzen cracked the phone of a suspect who was “subverting the government” to get data from his Facebook and Twitter accounts. The representative spoke on condition of anonymity. Other sellers tout police glasses that scan people and match them with a database of fugitives. There was also the AI-2000-Xiao An robot, a blue-eyed police automaton for use at train stations and airports. The robot, shaped like R2-D2 from “Star Wars”, but with red flashing “ears” and over a dozen sensors and cameras, can identify people in a crowd, engage in conversations and broadcast police announcements. The robots were used for security at an international summit last year held in the port city of Xiamen, state media reported. Zhao Jianqiang, an R&D manager at Meiya Pico, said the firm’s tools used artificial intelligence to detect “terrorism-related or violent content” online and on smart phones. Zhao cited images of guns, and the crescent and star symbols often found on the flags of Muslim nations. The firm also has software which can analyze audio files, convert voice messages into text, and translate minority dialects like that of the Turkic-language speaking Uighurs in Xinjiang into Mandarin Chinese. Chinese authorities over the past two years have escalated security and surveillance operations across Xinjiang, widely using technology to track the local Uighur population as well as other Muslim minorities, residents and human rights activists say. China denies carrying out repression in the region. The rise of sophisticated monitoring technology in China has raised fears among rights activists that Chinese citizens will have little space left that remains private. Public debate on the subject is more restrained though, with many resigned to the fact that individual rights are subordinated to state interests. Liu Haifeng, vice general manager at Xindehui, a Meiya Pico subsidiary, said he sees surveillance tech as a positive. “It is impossible for people, especially the younger generations, to live without electronics,” he told a roomful of police listening on at the Beijing event. Therefore, suspects trying to escape, “can never get away”. NAIROBI (Reuters) – A boom in lending by financial technology (fintech) firms in Kenya has led to an increase in predatory lending practices, the country’s central bank governor said on Tuesday, calling for the sector to be regulated. Kenya built a reputation as a pioneer of financial inclusion through its early adoption of a mobile money system that enables people to transfer cash and make payments on cellphones without a bank account. More than 20 companies are using the same technology to extend credit to the banked and unbanked alike, saddling borrowers with high interest rates and leaving regulators scrambling to keep up. From having little or no access to credit, many Kenyans now find they can get loans in minutes. “There’s an increase in let’s say financial-type institutions that are taking advantage of our population,” Patrick Njoroge told executives in the digital financial services industry at a conference in Nairobi. In the last three years, 2.7 million people out of a population of around 45 million have been negatively listed on Kenya’s Credit Reference Bureaux, according to a study by Microsave, a consultancy that advises lenders on sustainable financial services. As it was for mobile cash, Kenya is considered a test case for the new lending platforms. Several of the companies involved, including U.S. fintech startups, have plans to expand in other frontier markets, meaning Kenya’s regulation will be closely watched. Njoroge said he did not like the idea of his country being a “guinea pig” for new technology deployed by foreign companies. “What I think is worrisome is a lot of products that are coming in a sort of a fly-by-night operation and you only hear about it because somebody gets burned,” he said. He said the risks to Kenyans showed there was a need for regulation in the booming sector. A draft bill published by the finance ministry last week for review and comment by the public and industry says digital lenders will be licensed by a new Financial Markets Conduct Authority and lenders will be bound by any interest rate caps the Authority sets. But it is not clear if digital lenders are subject to the current government cap on banks’ interest rates which has slowed private sector credit growth since it was introduced in 2016. Njoroge did not comment on whether the draft bill would serve as an adequate check on predatory lending. “That’s for you to judge,” he said. BERLIN (Reuters) – Germany’s Rocket Internet said on Tuesday it is looking at investing in areas such as financial technology and artificial intelligence with the 2.6 billion euro ($3 billion) it has amassed. “We are looking for opportunities in the tech sector… There is no set timeframe,” the ecommerce investor’s chief executive Oliver Samwer told journalists after its main holdings saw more revenue growth and narrowed first quarter losses. Rocket Internet, which had a shaky start after listing in 2014 as its start-ups made big losses, saw its share price jump last year after HelloFresh and Delivery Hero went public. Delivery Hero, HelloFresh, Home24 and Global Fashion Group (GFG) have already reported quarterly figures, while Home24 announced plans earlier this month for an initial public offering. Rocket’s stock dipped last week after disappointing figures from GFG and its shares were down another 0.4 percent following its quarterly results. Kimpel said GFG, which runs fashion sites in Russia, Latin America and southeast Asia, was hit by the decline in the Russian rouble and Brazilian real, noting that sales rose 18 percent after stripping out the impact of currency fluctuations. Rocket said its African ecommerce group Jumia, also a possible candidate for a listing, saw gross merchandise volume – the value of goods sold via the site – rise 71 percent to 151 million euros, adding it remained well funded. However, Samwer added that he could imagine the loss-making firm might need to raise funds in the next 24 months. Online home furnishings site Westwing saw sales rise 18 percent to 71 million and reported its second consecutive profitable quarter, with an adjusted earnings before interest, taxation, depreciation and amortization margin of 1.7 percent. If you’re not a Golden State Warriors fan, you likely don’t warm to Draymond Green. The power forward might seem to you like an arrogant, big-mouthed bully who, just as many bullies do, whines when he doesn’t get his way. As far as former NBA whining bully Charles Barkley is concerned, well, he offered that Green annoys him so much he’d like to punch him. Which conjures too many awkward images for my taste. I fancy, though, that Barkley’s fist-swing is about as good as his golf swing — uglier and more ineffective than espadrilles in a rainstorm. However, the former so-called Round Mound of Rebound was suddenly confronted with Green face-to-face after Game 6 of the NBA Western Conference Finals on Saturday night. Would he take a swing? Or would he merely choose to insult the Warriors star a little more, in that adorable joking-not-joking manner? And how might Green react? Well, Barkley cowered somewhat. It was left to fellow TNT panelist Kenny Smith to point out that Barkley, in his dim, distant playing days, wasn’t dissimilar in style to Green. The only criticism he could articulate was that Green never admitted to committing a foul. And then, perhaps, well, there’s all the physicality — some borderline, some even worse — that Green brings to his game. For his part, Green could have reacted to Barkley in so many different ways. He could have offered a politician’s bluster. He could have offered some bland statement that avoided the question. He could even have snarled. Instead, he just admitted that he knew precisely why some people don’t view him with kindness. He said that he didn’t think anyone in the NBA thought they ever committed a foul. Criticism is hard to take. The problem is that, occasionally — very occasionally — it’s true. If you recognize that a criticism is true, there’s something glorious in admitting it. Your ego is vast and vulnerable. Admitting fault feels like losing — or, even worse, exposing an ugly truth about yourself. Oddly, though, you might find that people respect you more for showing that you at least know how you’re perceived by others. I confess that, even though I’m a Warriors fan, I’m occasionally exasperated by Green’s highly sensitive reactions to alleged injustice. Yet seeing him react with poise and honesty was a refreshing reminder that we’re all desperately imperfect. Privately, we beat ourselves up over these imperfections. To admit to them in public is the first step to a sane redemption. HONG KONG (Reuters) – Tencent Holdings chairman pledged to advance China’s semiconductor industry, saying the blow to ZTE Corp from Washington’s ban on U.S. firms supplying telecommunications company was a “wake-up” call, local media reported. China’s No.2 telecom equipment maker ZTE was banned in April from buying U.S. technology components for seven years for breaking an agreement reached after it violated U.S. sanctions against Iran and North Korea. American firms are estimated to provide 25-30 percent of the components used in ZTE’s equipment. While the U.S. administration said on Friday it had reached a deal to put ZTE back in business after the company pays a $1.3 billion fine and makes management changes, the plan has run into resistance in Congress, indicating ZTE was still far from out of the woods. Also, ZTE is yet to confirm the deal. “The recent ZTE incident made everyone more clearly realize that however advanced one may be in mobile payment, without the mobile, the chips and the operating system, you still cannot compete,” Chinese media reports cited Tecent’s Pony Ma as saying at a forum in Shenzhen on Saturday. Tencent, which alternates with Alibaba Group to be Asia’s most-valuable listed company, is the largest social media and gaming company in China and operates the popular WeChat app. Ma said “even though the ZTE situation was in the process of being resolved, we must not lose vigilance at this time and should pay more attention to fundamental scientific research”. Tencent is looking into ways it could help advance China’s domestic chip industry, which could include leveraging its huge data demand to urge domestic chip suppliers to come up with better solutions, or using its WeChat platform to support application developments based on Chinese chips, Ma said. China has been looking to accelerate plans to develop its semiconductor market to reduce its heavy reliance on imports and has invited overseas investors to invest in the country’s top state-backed chip fund. Now, it turns out we’re separated by something else we have in common, too: McDonald’s. Yes, there are differences in how the Big Mac and French fries are made and taste on this side of the Atlantic versus that one. But, there’s also something else different that’s become clear lately. It has to do with how McDonald’s in the U.K. unceremoniously got rid of plastic straws two months ago, acquiescing to environmentalists who pointed out just how much plastic gunky waste we create and destroy each day. And then, McDonald’s in the U.S. considered something similar–with a very different result. Almost everyone over there seemed cool with the idea that we should just switch to paper straws for the benefit of the environment, and be done with it. “Straws are one of those things that people feel passionately about, and rightly so,” the McDonald’s chief executive in the U.K., Paul Pomroy, said at the time. But remember: separated by what we have in common. Because this week, McDonald’s in the U.S. took a look at a similar proposal. Actually, it wasn’t even a proposal to ban straws: it was just a proposal to study what the effect might be, at some time in the future, if they did ban straws. An activist group brought up the idea at the annual shareholder’s meeting this week, and the company put it to a vote. It wasn’t even close: 92.35 percent of shareholders voted against it. Think of it: 92 percent. That’s even better than the sham election percentage in Venezuela or Russia. Okay, that’s great about the image. But McDonald’s distributes an estimated 95 million single-use straws a day, worldwide, according to SumOfUs, which is the group that made the proposal at the shareholder’s meeting. Do a little quick math–like extrapolate that over 365 days–and it means that on average, McDonald’s goes through more than four straws a year for every single person on the planet. So that’s the big difference, I guess: In the U.K., apparently, people are concerned enough about the plastics in the environment to make this change; in the U.S., McDonald’s is apparently confident that it won’t matter. Do with that what you will. Meantime, yes, there are other differences. The fries–they’re floppier over there, according to a study that the British television network Channel 4 did last year. Their testers liked the U.S. version better, but backpedaled when they learned the British ones had fewer preservatives. The Big Mac in Britain is smaller, although it tastes the same, according to the same study. Maybe just buy two if that’s an issue. And they hav some special sandwiches, and sauces, and stuff, that you can only get in the U.K. Meantime, the straws. The state of California is considering banning them outright. I thought recently that plastic straws were the plastic bags of 2018. Maybe they’re the plastic bags of 2020. Anyway, the world itself keeps getting smaller. McDonald’s in the U.S. has a CEO from the U.K. And eventually the differences will be even harder to identify. You’ll be able to get the same shake here as you get there–you’ll just be sipping it through paper. For most executives, organizational culture has been a bit of a mystery. We read about companies with great cultures: Zappos, Rackspace, REI, Southwest Airlines, etc., but how did they create workplace environments that enabled their employees to be more efficient, passionate and effective? Was it deliberate? If so, can it be repeated and designed? For ten years, Gapingvoid Culture Design Group has been working with some of the most culture-centric businesses in the world — seeing what works — and developing new approaches to design and scale what we call end-to-end Culture Design. In the midst of their tinkering and testing, Gapingvoid has come up with something incredibly useful, scientific, artful, and effective. The tool they’ve developed is so effective that many of the leading entrepreneurs and organizations are using it. Organizational culture is the product of the mindset that your people bring to work every day. It is informed by a complex mix of beliefs, values, capabilities, vision, mission, purpose, etc. When taken together, your culture becomes the operating system of your organization. It defines how people do everything, and how they operate and relate to rules and their coworkers. Paraphrasing our friend and client, Tony Hsieh, the CEO of Zappos and one of the great culture innovators of our time: “Culture is the only thing that your competitors cannot steal or copy”. Only you have the ability to create a unique experience within your business, for employees and customers. Only you can craft the impact that you want to have on your community and the world. You cannot simply do this by making a better mousetrap, or being cheaper or having a niftier app. These are simply outcomes from highly motivated people working together. It starts with people. Communicate: The key to culture is communication. It is simply impossible to build a great culture without the vocabulary and tools to introduce the beliefs that drive culture at scale. Traction is driven by the ability to articulate and visualize the cultural norms that will help your leaders lead and turn culture into a movement. Spread Culture: Your Culture Wall is designed to be an essential tool for building and spreading culture. In application, it becomes the center of your conversations about meaning, purpose and mindset. It’s the most effective way to spread ideas that otherwise are really hard to communicate. 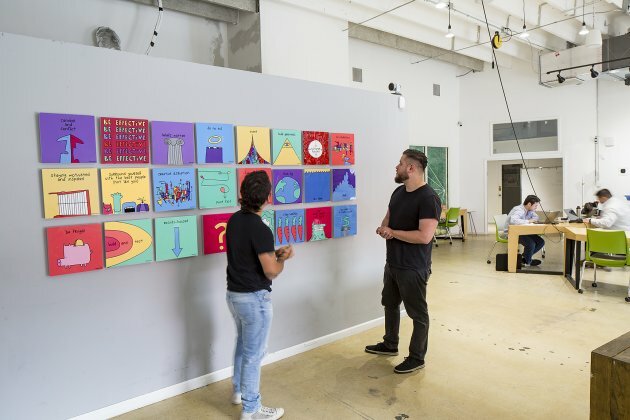 Socialize Beliefs: The Culture Wall transforms your office into a metaphorical and physical shrine to your culture through the socialization of your company’s beliefs. The wall aligns your people’s mindset to the mission of the company by reminding them of the purpose behind their work, and why they do what they do. I’m both an organizational psychologist and an entrepreneur. By training, I study organizational culture, behavior change, and leadership. I’m always looking for how the cutting-edge entrepreneurs and organizations are optimizing their people. Over and over recently, I’m seeing some of the best thinkers using Gapingvoid’s work. As a member of the elite Strategic Coach 10X program, run by Dan Sullivan, I’ve seen Gapingvoid culture walls all over the Strategic Coach offices. Similarly, as a member of Genius Network, the high-tier entrepreneurial mastermind run by Joe Polish, I’ve seen Gapingvoid culture walls all over the Genius Network offices. I’ve seen there other places as well. Here’s what excites me. While at both Strategic Coach and Genius Network, I hear not only employees continually references the values and beliefs, I also hear the clients discussing the values and beliefs. This shows me that the culture is being translated through the culture wall into the people. I’ve experienced it first hand. It works. This is an incredibly innovative, scientific, and artful approach to culture design. And from what I’ve gathered, the most influential and cutting-edge entrepreneurs are using these. Last month I spent a week in Moscow where I spoke at the Skolkova Robotics Forum on Smart Matter: 4 Things That Are Making Every “Thing” Smart. While there, I happened to visit a very unique gallery in the heart of Russia’s top cybernetics institute, the National University of Science and Technology, or MISiS. After viewing some of the art, our conversation surprisingly turned to blockchain. To put it mildly, that’s not what I expected from an art historian. But as the conversation developed, it became clear that artists and curators are looking to blockchain as a possible solution to three problems in art. Provenance, or where an artwork came from, is always a challenge. Fraud will be an issue as long as people are paying millions of dollars for famous paintings. And knowledge about the art is something that curators are always hoping to share. Koetsier: How can blockchain help artists and the art world? For us collectors, the most attractive and important thing this technology can give is the potential transparency of all the processes. In the open decentralized database which we can already build with the use of blockchain, we can store information and learn about the origin of the artwork … we can get info [such as] who’s the owner of it and who owns the copyrights. This technology also makes it possible to monitor all the transactions with the particular piece of art and maintain the provenance (exhibitions participation, publications in the catalogs, etc.). If we have such a database, all the painters and their heirs will be able to track all the movements and relocations of their artworks. This will protect them from illegal sales and situations when after the exhibition the works are not returned to the owners for long time. It’s worth mentioning that the technology will be really useful and important for acceptance of artist’s resale royalties. So in long term perspective, painters and collectors will be more willing to participate and give their works for various temporary exhibitions. The most interesting feature that can be developed with the help of blockchain technology is the possibility to purchase a piece/a share of an artwork. But for this one – the necessary legislative base is not yet available in the world. Uskova: In this regard, in my opinion, we can implement such an advanced thing as a special cryptocurrency that will be used to evaluate artworks. Accumulation of the art’s capital/net worth can depend exclusively on demand: for example – on the total number of views or on the number of acquisitions. Koetsier: Where would it be the most useful? Karganova: First of all, blockchain technology can significantly help us increase and control circulation of the artworks. If we link all the originals to a single open database – this will ensure the number of copies of the paintings/photos/videos is fixed and guaranteed. In general, for all the new multimedia in art – blockchain is a perfect breakthrough system. And it will be especially interesting for those potential buyers who are attracted by innovations and high-tech in arts, but who are often stopped from a real purchase because of the particular insecurity of the art segment. Koetsier: Honestly, I was really shocked to hear you talk about blockchain. Maybe I had an internal prejudice … art is creative, and blockchain is technology. How did you get interested in technology? Karganova: Art and Technology have been linked for a long time already and we just can’t ignore this fact. Some time ago there were doubts about online auctions, but now this method of bidding has successfully and organically merged into the art environment that is historically quite conservative. The convergence of arts and technology is a process that comes from several directions. Artists who work with audiovisual and VR technologies often build their works on the basis of rethinking classic art and ideas embedded in it. More and more traditional museums include media artworks in their expositions. And of course all museums are trying to make their expositions digital to store them in worldwide web. One of the important reasons for this is the necessity to attract young audience. There are steps towards art from the developers of artificial intelligence too. Uskova: Blockchain is a technology that is based on a new revolutionary ideology. For the artist it’s not only about the safety of the artworks’ storage and an easy access to virtual galleries, but it is an opportunity and a tool for creation of a new type of digital art. For example it may be an object that consists of many decentered, infinitely embedded worlds that are linked to and united by a single idea. In the collection of our foundation we have works of a unique artist, Vladislav Zubarev. Back in 1977, when the world hadn’t yet suspected the existence of String Theory and before the discovery of the Higgs Boson particle, Zubarev introduced to the contemporary art world his Concept of Temporality. He said that in a current time, with its dynamics and pace of change, it’s impossible to be a truly modern creator without putting time into a single coordinate system. He began to draw in four dimensions and his paintings got really magical dynamics, secrets of which are still not solved up to date by experts from around the Globe. Zubarev’s Theory of Temporal Art (1977) included so many correct guesses about the nature of space and time that in 2000s delegations of physicists visited him trying to understand how could an artist in the 1970s visualize what has later been discovered in 2000s. So this is what can happen with blockchain technology too. Decentralized blockchain is a system of the different connected worlds of ever-changing information … a great basis for art objects of a new type. Koetsier: How big an issue is fraud in the art world? Any idea of the scope of the problem? Uskova: The problem of buying fakes is not that big at the moment as it was 10-15 years ago. There are several explanations for this. Firstly, buyers’ interest has shifted towards the post-WWII and contemporary art, where there are a lot of options to track the origin of the artwork and its provenance. Secondly, methods of technological analysis have really improved. As for those who prefer to buy antique and classic art – these people do this for many years already and they are experts themselves. It’s more correct to call them not collectors but connoisseurs. For Russian art, the most frequently falsified period is Russian avant garde of the beginning of the 20th century. It may now seem to everyone that the most famous fraud cases are left in 2000s, but nearly several months ago the Museum of Fine Arts in Ghent was involved in one huge scandal. Russian and international experts doubted the authenticity of some avant garde paintings from one private collection on show in the museum. This led to a large-scale investigation and early closure of the exhibition. It turned out that the provenance of paintings was unclear and consisted of different fake legends, and even the mentioned publications in exhibition catalogs were forged. So what should we prepare for? I think that in a short term perspective the art of the middle 20th century will be in focus of fake makers. In Russian Abstract Art Foundation we have already started creating the database of samples for our artists and completing the catalogues raisonnés for internal use. Koetsier: Defending against fraud is one thing blockchain can help the art world with. Anything else? Karganova: Before buying an artwork, you should check as many details and facts as possible. There are two main types of expertise: technological research and the one provided by art historians. Technological expertise studies pigments & binders and defines whether the painting fits the period that is claimed. But this type of study doesn’t prove or identify the artwork’s authorship. To confirm or to disprove the authorship, during the technological expertise, experts take X-rays. This study case helps to see the structure of the painting and compare it to the museum samples. In some cases ultraviolet light may be implemented. It identifies the signatures applied over the old varnish and shows the preparatory drawings that are individual for each artist. If we talk about the expertise by art historians, they usually do some kind of a scholarly research. If you are about to close a deal, it makes sense to ask for an opinion of several experts, and better from different countries. Usually for a certain time period or an author – there is a limited number of experts. If two or three experts say that the work is genuine, then in the case of suspicion there will be no one to make an objection. The given certificates themselves should also be checked for authenticity. Nowadays to do that, specialists from auction houses ask the organization, that provided the expertise, to confirm has it issued the submitted papers or not. All these processes are very time-consuming. And just imagine if all the data could be uploaded to one open database! A clear provenance is a very strong reason to buy an artwork. The ideal and rare situation is when the whole history of the artwork can be traced from the artist’s studio to all the exhibitions and all owners. If any time periods are missing – then the provenance research is required. Koetsier: Anything else that I’m missing? Uskova: Nowadays we can witness just the beginning of the blockchain technology formation process; it is now still on the early stage. But the first deals begin to appear. There are still very few of them, but they set a precedent and allow us to identify all the possible downsides and limitations. I think that the attractiveness of blockchain will grow with the generation that develops it. The great role of the current art world is played by people who are used to some certain rules and entourage. Pre-auction exhibitions, electrified atmosphere in the auction houses, discoveries of various unexpected data, positive art experts’ feedback – all of these provides emotions that are so important to the collectors of the old formation. This emotional experience, that is integral from the process of artwork purchase, is one of the most important parts of arts collecting. When people for whom speed and results are more important will get the necessary resources — then the introduction of the blockchain will no longer be an issue. But now, when mathematicians and software developers work with AI projects, they also can no longer work without Contemporary Art. For example the Cognitive Pilot project team, that is now developing neural networks for self-driving cars, has recently moved to a new level – developers are now creating emotions for artificial intelligence. This kind of work requires a fundamentally different approach: not mathematics, but arts … in order to understand and project emotions. So in order to understand different emotions, neural networks specialists participate in master classes about Arts that are conducted by the unique method of Ely Belyutin. Modern programming is a form of a modern art. It has ceased to be a purely logical apparatus. With the advent of heuristic methods of programming and the creation of AI-objects, software products have a new theme of emotion that is so inherent to contemporary art. Koetsier: Thank you for your time! I know this because I follow him on Twitter and his tweets today are coursing with something that looks like rage. Tesla’s CEO seems to believe that the media are writing unfairly about his cars, including the Model 3. Oh, this doesn’t bother me so much. As it happens, friends of mine bought a Model 3 recently. They love it, save for the first five minutes of embarrassment when they realized they’d never test-driven it and had no idea how to switch it on. Still, some members of the media are concerned, for example, that the thing Tesla calls Autopilot isn’t really an autopilot and lulls drivers into a false sense of auto-relaxation which might lead to auto-mishap. Musk, though, thinks the media auto-overplays accidents involving his cars. This has now led him toward threatening to create a site that examines journalists’ truthiness. Yes, Pravda already exists, but I doubt it will sue. I fear, though, a Russian person in a bedroom somewhere might get upset and, well, you know, start messing with Teslas from afar. But this isn’t what bothers me either. Nor is it even his accusation that because Tesla doesn’t do paid advertising — in the conventional sense — it’s likely to get poor media coverage when compared to, say, conventional car companies that advertise seemingly all the time, everywhere, until they really do sound like the car dealers so many try to avoid. Problem is journos are under constant pressure to get max clicks & earn advertising dollars or get fired. Tricky situation, as Tesla doesn’t advertise, but fossil fuel companies & gas/diesel car companies are among world’s biggest advertisers. This does seems strange. Tesla really doesn’t have to advertise because Musk and the fascinating nature of cars garner so much free publicity. I can think of few business or tech personas who receive more favorable fawning that does Musk. And sometimes, with good reason. He’s engaging, forward-looking, even occasionally witty. The fact that he’s suddenly railing against his fawners still doesn’t bother me too much. No, what bothers me is the logic in another of Musk’s Wednesday tweets, the one that represents the core of his ire. In it, Musk bristles about being compared with a certain president who’s not fond of being subject to negative media appraisal. Thought you’d say that. Anytime anyone criticizes the media, the media shrieks “You’re just like Trump!” Why do you think he got elected in the first place? Because no ones believes you any more. You lost your credibility a long time ago. My eyebrows did commit a strange shivering motion here. You see, if no one believes the media anymore, why should Musk worry about what the media writes? And, well, there you have it. Just a bit of auto-suggestion.